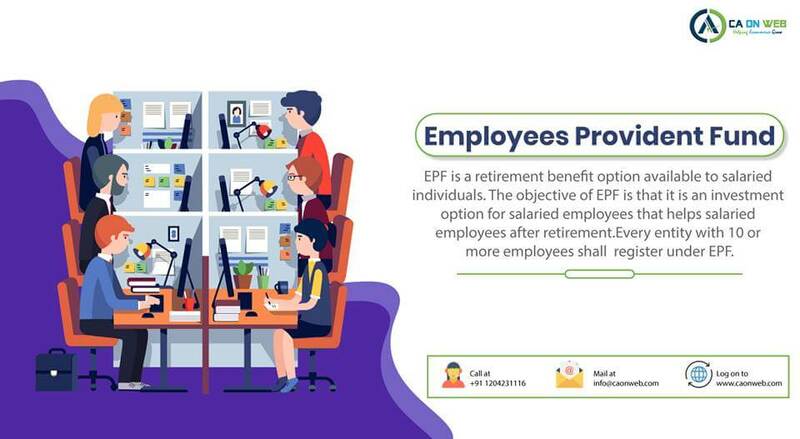 EPF is a retirement avail option available to salaried individual’s person. The objective of EPF is that it is an investment option for salaried employees that help salaried employees after retirement. Every entity with 10 or more employees shall mandatorily register under EPF. Any entity can also of his own accord go for EPF scheme. Under Employee provident fund plan, 12% of basic salary is contributed by the employee and another 12% is contributed by the employer, Therefore total 24% is contributed every month. The (UAN) Universal Account number is allotted to every member registered under EPF, UAN will act as an umbrella for the multiple Member Ids allotted to an individual by different establishments and also remains same through the lifetime of an employee. You can register your entity to EPF organization through us. 1. Is contribution to the EPF obligatory? For those who have a basic salary of above Rs. 6500, contributing to the EPF is compulsory. Contributions are voluntary for those whose basic salary exceeds Rs. 6,500. However, it is strongly recommended to make such contributions to avail of the various benefits an EPF account has in store. For those who have. 2. How can an entity get registered under EPF? The easiest way to register under EPF is get it done through our experts such as caservicesonline. 3. What are the documents required for EPF registration? A details of the bank statement or canceled check. The activities engaged by Establishment. The same can be selected from the list given under the Act. In case any previous code is granted under ESIC the copy of same. The documents as evidence of address proof along with the list of branches and address with a number of an employee at each branch. Consent letter from the employee with details and signature and date of the agreement. Date of establishment of an establishment with evidence thereof. The details of ownership along with evidence. For factory: details of managers and license details. The details of all employee engage with Establishment. Wages disbursed for the month. Income Tax Permanent Account number. 4. What are the benefits provided under Employee Provident Fund Scheme? The benefit of non -Refundable advances. 5. Can I check my EPF contribution anyime? Yes, you can access it online anytime through epfindia website. 6. Is it possible to contribute more than 12% to the EPF? Yes, you can voluntarily contribute more amount to your EPF fund. 7. Does one need to visit officials or department to get entity registered?